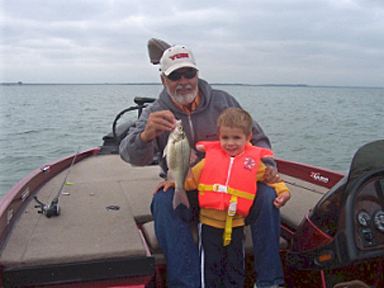 Tim is a full time licensed and insured professional fishing guide on Lake Ray Roberts. He has been guiding on Ray Roberts for 10 years. He has been fishing all his life and for the last 40 years has been a serious bass fisherman. Having fished Lake Ray Roberts exclusively, since it opened to motor boats in 1990, he knows the lake. Fishing for largemeouth bass in the warmer months, and white bass all year round, Tim has always had an obsession with deep water structure fishing. Having spent countless hours on Lake Ray Roberts studying maps and searching the depths with electronics, he knows the the main lake structure on Lake Ray Roberts like the back of his hand. Using triangulation, he is as comfortable fishing spots in the middle of the lake as most fishermen are fishing stumps in the back of a creek. Your Lake Ray Roberts guide trip with Tim will be as instructional as you want it to be. You can learn a lot in one trip about electronics, GPS's and triangulation if you have the desire to. Before opening Reelin Ray Roberts Guide Service, Tim was in the grocery business. Knowing the value of good customer service, he will work hard to make your fishing trip one you will remember and leave wanting to book another trip in the future. The father of four daughters and grandfather of nine he enjoys teaching beginners how to catch fish introducing them to this great sport of ours. Tim believes that the world we live in would be a better place if more young people got involved in the outdoors and spent less time in front of a video game or TV. For that reason he does not charge for children 16 and under making his trips affordable for family's. Fishing 200 plus days a year, Tim will know what the fish are doing. If for some reason the fishing is off he will tell you. Go to the Fishing Report page of our site to see what the fish are doing this week. Call or email Tim to book a trip or just talk fishing Lake Ray Roberts.